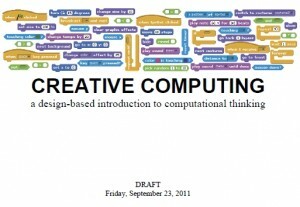 This Scratch curriculum guide provides an introduction to creative computing with Scratch, using a design-based learning approach. You can download the full, current draft of the curriculum guide below – available in both pdf and doc formats. 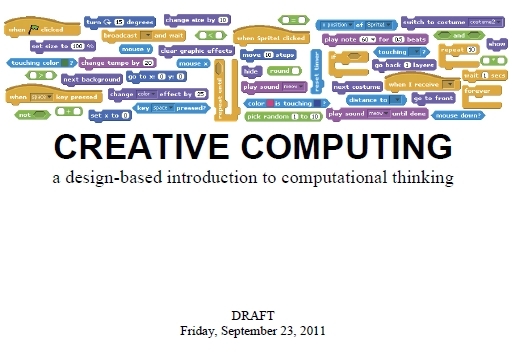 The guide was developed to be both subject-neutral and grade-neutral to accommodate different settings for any teacher who wants to support students’ development of computational thinking through explorations with Scratch. The content for the guide is based on four years of Scratch educator workshops, particularly the Google-funded 2009-2011 Creative Computing workshops and more recently, NSF-funded ScratchEd workshops and meetups. We are looking for educators who are interested in piloting the curriculum guide this year. If you would like to participate, please read the pilot invitation (attached below) to learn about the pilot and how to get involved. Now that the guide is launched, we’d love to hear your thoughts on it! Please share any feedback you have about the guide by posting comments in the Curriculum Guide Draft discussion forum. We’d love to hear any reactions on what works, what doesn’t work, and what it looks like in your classroom.